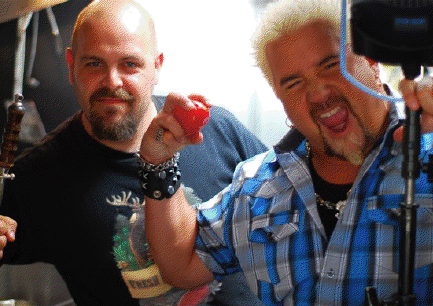 Back when the sun was still shining, Guy Fieri and the crew from the Food Network’s Diners, Drive-Ins and Dives were in town, shooting segments for the show. One of the few Vancouver eateries to be featured was Chef Josh Wolfe’s Fresh Local Wild food trailer at the corner of Burrard and Hastings. As the world’s only mobile patio with chef prepared food Fresh Local Wild caught the eye of the show’s producers. They spent an entire day shooting with Chef Wolfe, his team, and the line-up that always forms well before lunch time. To celebrate the premiere of the episode, Chef Wolfe is hosting a viewing party at Coast restaurant. Who: Join Chef Wolfe as he welcomes the public to view the episode Fresh Local Wild is featured on Diners, Drive-Ins and Dives.